If you are a resident over in the good old US of A, and thought there were enough authorised places where you could purchase a smartphone, you are incorrect, as another authorised outlet has now started offering smartphones for purchase. That outlet is Blockbuster, who will start selling smartphones in their movie rental stores. According to a report by Bloomberg, over in the USA, Blockbuster Mobile offering mobile phones from their stores is a test for the planned entry into the wireless game by Dish according to two unnamed sources that are familiar with the matter. 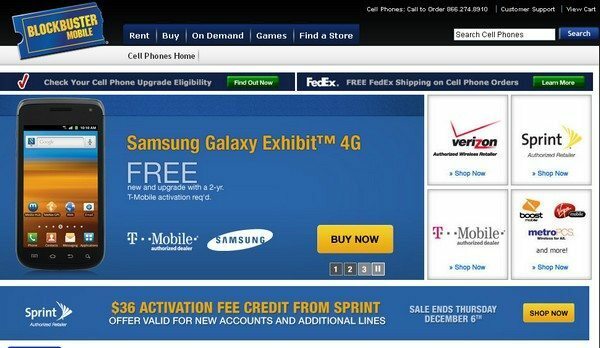 The movie rental people began offering mobile phones on their website recently under the name of Blockbuster Mobile, and mobile phone purchases will soon be offered in about 850 Blockbuster retail locations. Blockbuster Mobile is powered by Simplexity, an authorized dealer for Verizon Wireless, Sprint and T-Mobile. Satellite TV service Dish, last year acquired the Blockbuster chain, and the move could possibly be a prelude to Dish offering their own mobile phone service, and the firm is awaiting rules from the FCC on how they can used the swathe of wireless airwaves they have acquired. Apparently since purchasing the Blockbuster chain back in April last year, Dish has planned on using the Blockbuster stores to sell mobile phones. If Dish does offer their own wireless service it could of course pit them against rival carriers such as the top two US carriers that control in excess of half of the US market, Verizon and AT&T, although Dish could possibly enter into a joint venture with an existing carrier; however those efforts have apparently been delayed due to industry consolidation. When Dish acquired the company out of bankruptcy last year, Dish closed roughly half of Blockbuster’s 1700 stores; however, obviously when it comes to retail fire power, the major US carriers hold the advantage. So there you go you can now purchase mobile phones from Blockbuster Mobile, will any of our readers be opting to get their next handset from Blockbuster Mobile?